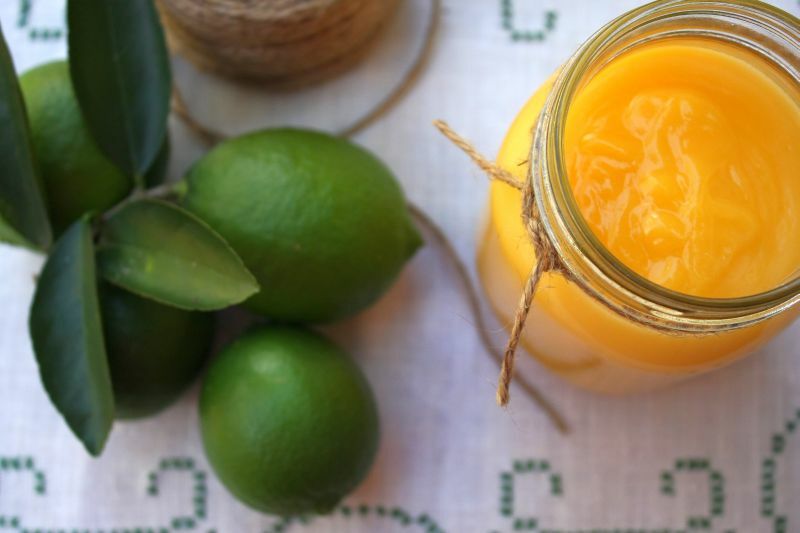 Both my husband’s family and mine have a long tradition of growing citrus trees and making mouth puckeringly tart lemon and lime curd. The limes I used for this recipe were picked from the tree just before I made the curd. I have toned the amount of juice down a little in this recipe because most people can’t quite manage our family’s preferred level of sourness. If you have lemons, just substitue for the limes. Lime curd is very versatile and works well in tartlets for afternoon tea, as a filling in a sponge for a birthday treat, or just spread onto toast at breakfast. When I was growing up, my dad used to feed small pieces of fresh white bread spread with lemon curd to Purdy, our Irish Setter! It was her absolute favourite ‘people food’ and she always knew when mum was making a batch by the heady aroma of freshly squeezed lemons in the kitchen. Place the butter, sugar and lime juice in a small saucepan over a very low heat and cook until the butter is just melted. meanwhile, in a medium bowl, whisk the eggs thoroughly. When the butter is melted, pour the warm mixture into the beaten eggs, whisking all the time. Return the mixture to the pan and bring gently to the boil, whisking all the time. It should suddenly start to thicken just at the point it starts to boil. Remove from the heat and strain through a seive into a glass jar. Before using the jar, make sure it is clean and dry. (I like to put jars through the dishwasher to sterilise them before use). Lime curd will keep in the fridge for about 2 weeks, if it lasts that long. Have you tried passion fruit curd? A few years ago I had a passionfruit vine and we made passionfruit curd then. My mouth is watering even thinking about it! Passionfruit is such a gorgeous flavour. Yum– that photo alone is making my mouth water! Delicously decadent, I love this, very tart, spread on toast for breakfast! Speak it to me, sister! The tarter, the better.